A grand-niece of prominent Indian freedom fighter, Maulana Abul Kalam Azad, Dr. Najma A. Heptulla is a five-time member of the Rajya Sabha, the Upper House of the Indian Parliament, between 1986 – 2012. She was also the Deputy Chairperson of the Rajya Sabha for sixteen years. In May 2014 she took oath as Minister of Minority Affairs, Government of India. The evening of November 23, 2015 saw a spectacular musical offering to Bhagawan on His 90th Birthday. 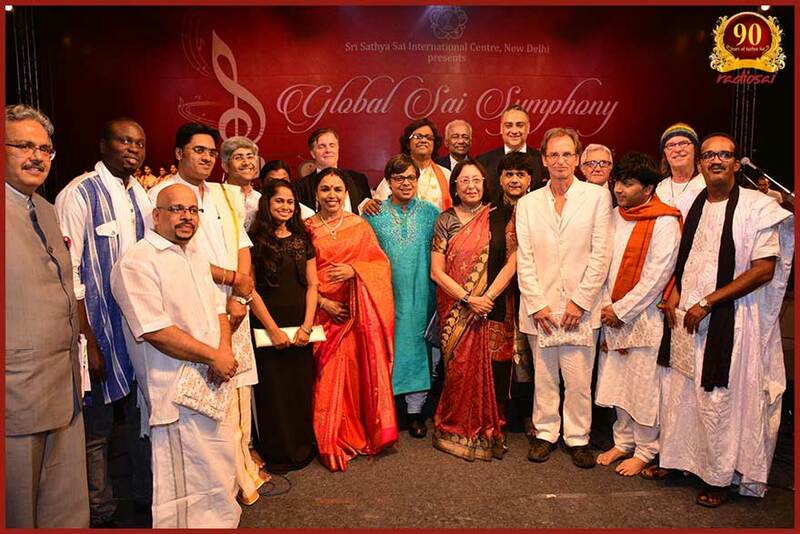 126 musicians from 16 countries had come together to glorify the Lord through an unique blend of Western and Indian classical music. Specially composed by the acclaimed German composer Mr. Michael Herting and conducted by another renowned German musician, Dr. Michael Koehler, it was a symphony made in heaven and performed by 'stars'. 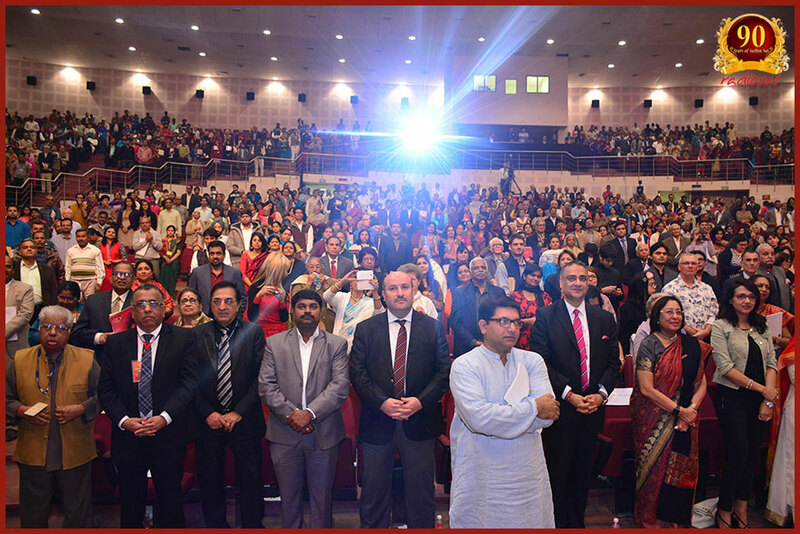 After its spellbinding presentation in the Sai Kulwant Hall on the Birthday evening, this dedicated group did an encore in the Indian Capital, New Delhi. It was now performed in the Jawaharlal Nehru Indoor Stadium to a packed audience on the evening of November 28, 2015. 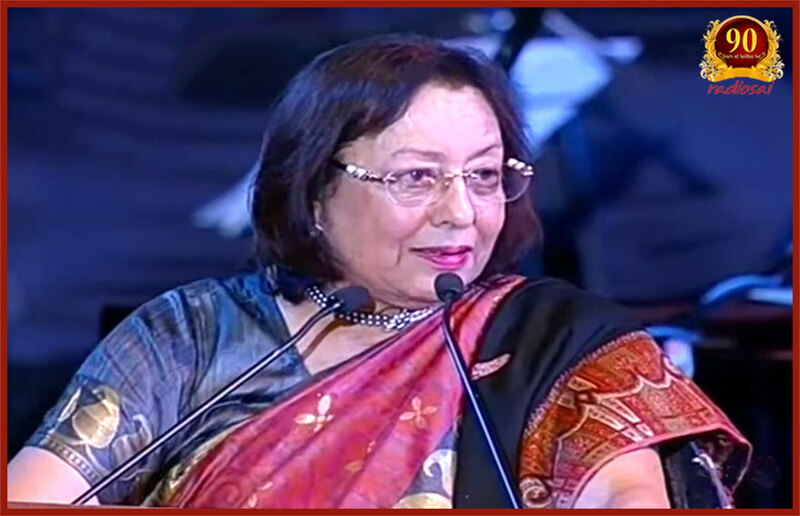 One of the Chief Guests that day was Dr. Najma A. Heptulla. 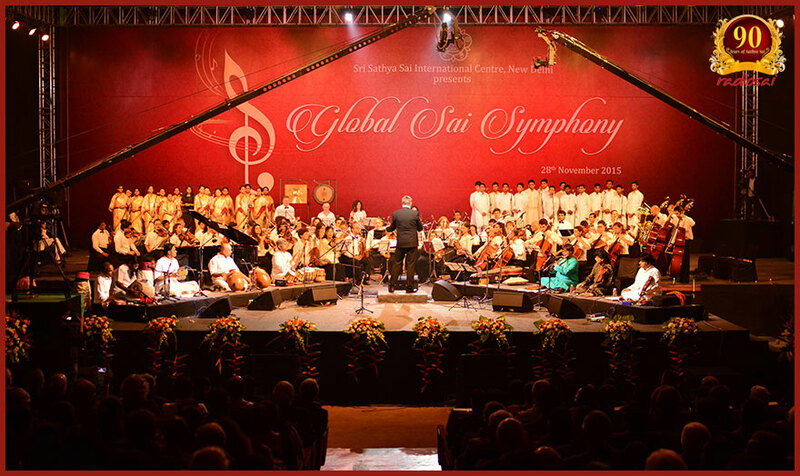 Presented below is the edited transcript of her talk before the commencement of the Global Sai Symphony. My respects and tributes to Baba on His 90th Birthday. Let me share with you my experience of how I came in contact with Baba. This happened 50 years ago. My would-be husband wanted to marry me. But we belonged to two different sects of Muslims. In those days this was difficult, so our marriage was getting into a lot of problems. I was then living in Bhopal while he was in Mumbai. At this time one of his South Indian friends one day told him about Sai Baba and took him to Puttaparthi. It was December 1965. Puttaparthi of course was not like how it is now. He then told me the whole story of his meeting with Baba and how our marriage happened and so on. Until then I had no clue of any of this. I had not even heard of Baba. But now I had a strong desire to go and see this Person with whose blessings we were married. Meanwhile I got elected to the parliament in 1980. I used to tell my husband, “Let's go to Puttaparthi and pay our respects to Baba. I want to meet Him.” But somehow this did not happen for quite some time. I said, “Can you convey my respects and my desire to go over there please.” Also I immediately wrote a letter to Baba and asked him to give it to Baba on my behalf. After this I told my husband, “Next week we must go. That's it!” And we were in Puttaparthi. Before I proceed let me tell you something interesting about my husband's first trip. He had then travelled from Mumbai to Puttaparthi in a car. It was a Morris Minor Tiger, a small black car. After the interview with Baba, when he was getting up, the keys of this car fell down from his pocket. Baba instantly picked it up and gave it in my husband's hands and blessed him. After our marriage we travelled over 5000 kms in this car. We almost did a 'Bharat Yatra', a mini tour of India. We went all over Rajasthan, Madhya Pradesh, Uttar Pradesh, Delhi and so on. During this entire trip this car never stopped or had a flat tyre or gave any problem whatsoever. We never sold this car. By the blessings of Baba even today this car is still with me! Like this many interesting things happened in our lives. When we went there as a couple for the first time, we were accommodated in the Round Guest House. There was a wish in my mind which I did not share with anyone, not even my husband. I thought, “If Baba calls me today I must get a green ring. I will not go from here till I receive Baba's green ring.” In fact I removed what I was wearing on the ring finger to keep it empty, waiting for the new gift. That is how He gifted me a green ring. I shared this only to tell you how He knows us through and through and how He cares for us. Let me narrate another instance. On the occasion of Diwali Mr. Kulwant Rai, a great devotee of Baba, had come to my house. He was like a brother to me. I saw that on his finger was a multi-coloured nine-gemmed ring. “What happened to your green ring?” I asked him. I again thought in my heart “I too should get one like this.” But I didn't tell anybody. When I went next time to Baba's presence, He said, “Give me the ring.” So I gave the green ring onto His palm and Baba instantly changed it a multi-coloured nine-gemmed Navaratna ring! There is something more about this Navaratna ring. I used to wear it all the time. In it there was a pearl too. One day I noticed that the pearl had fallen off. I was very dejected. I took out the ring and kept it in the cupboard. Many years later when I was looking at my rings I saw that the pearl was there in the Navaratna! It came back. It's amazing! I'm a scientist. I did my Ph. D. in Science. I have no explanation for it. But I have experienced all this. There is another episode. I resigned from the Deputy Chairmanship of Rajya Sabha to become the General Secretary of my Party. Later I resigned from this position too and I was now just a Member of Parliament. I remember in October 1988, Mr. Shankar Dayal Sharma was the Vice President of India and the Chairperson of the Rajya Sabha. He was also a devotee of Baba. I thought “Perhaps Baba has forgotten that I am no more the Deputy Chairperson of Rajya Sabha.” But I decided to kept quiet. I thought “Why should I correct Him? He is always right.” Interestingly, in the same year, in December, I was re-elected as the Deputy Chairperson and I remained in that position till 2004 when I myself resigned. This is how I have experienced Baba in my life and I am sure all of you must have many more stories to talk about Him. He could read the mind. One day in His room, He suddenly told me, “See! So many Muslims are here!” We were eight of us. Apart from my husband and I, there were two ladies and a child from Iran, and another couple with their son from Trinidad and Tobago. He knew everything. To me, Baba's greatest contribution is in the fields of education and health care. Through His message ‘Love all, serve all’ He gave us a path to follow. Today I feel extremely humble standing before all of you. So many of you have devoted your lives for the service of the people in memory of Sri Sathya Sai Baba. This is a grand finale of the year-long celebration of His 90th birthday. Let's make a vow today. Let's make a pledge. From now onwards, each one of us will devote ourselves in the service of people, in the service of mankind, spreading love and affection. I wish Baba was here today. But I am sure He is there; His spirit is there. I congratulate the 126 artistes and musicians from 16 countries who are here to pay their tributes in memory of Baba. I also congratulate all His hundreds and thousands of devotees all over the world who are working in His name in the service of mankind with love. Thank you very much.